LaMichael James will be identified as LaMike on the press box flip cards during Thursday's preseason game. 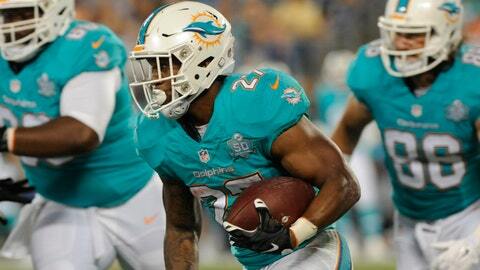 DAVIE, Fla. (AP) — If LaMichael James is to make the Miami Dolphins’ final roster, he’ll do it as LaMike. No. 27 will be identified by the shorter first name on the press box flip cards at Thursday’s exhibition game against Tampa Bay. That’s a change for James, who has long been known by football fans as LaMichael, including when he finished third in the 2010 Heisman Trophy race with Oregon. "I prefer you call me LaMike," James said Tuesday. "With LaMichael, I might give you a cold shoulder." Web sites, Dolphins publications and even James’ paycheck refer to him as LaMichael. But he said his friends and family have always called him LaMike, and he claimed that to be the name his Dolphins teammates use. He said he’s not even sure where the longer first name came from. "I have never heard my mom say LaMichael ever," he said. Dolphins officials only recently became aware he prefers LaMike. Coach Joe Philbin was surprised when asked Monday about James’ preference to be called LaMike, but was fine with the switch. "That’s the first I’ve heard of it," Philbin said. "We aim to please here." As either LaMike or LaMichael, James can only hope he doesn’t hear his name when final roster cuts are announced this week. If he makes the team, it will be as a kick returner and third-string running back behind Lamar Miller and Damien Williams. `I’m not worried about it," James said. "You just try to go out there and lay it on the line, and then whatever happens, I’m going to roll with it. There are going to be other teams out there." But he hopes to stay with the Dolphins. After all, they know him by the name he likes best — sort of. Quarterback Ryan Tannehill smiled when asked how he refers to James. "LaMichael? I call him LaMike."